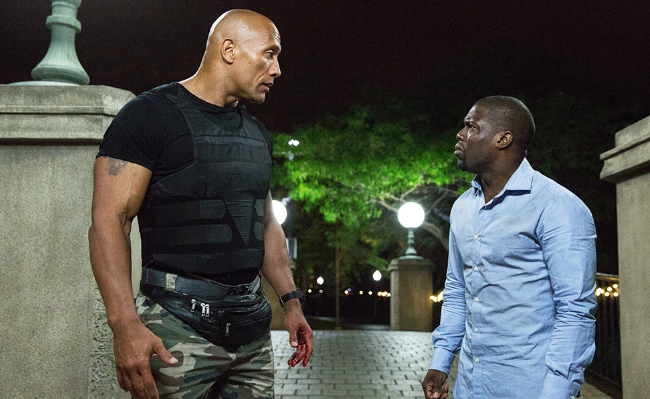 What would a Summer-Movie-Season be without Kevin Hart and Dwayne ‘The Rock’ Johnson? This summer, the two team up in an action-comedy called ‘Central Intelligence‘, directed by Rawson Marshall Thurber (‘Dodgeball‘ and ‘We’re The Millers‘) and co-written by actor/writer Ike Barinholtz (‘Neighbors‘). With so many buddy-cop action comedies out there, it’s sometimes difficult to tell one of them from another. Sure, there are the greats like ‘Lethal Weapon‘, ‘Turner and Hooch‘, and ‘Tango and Cash‘, but what does modern day buddy-cop action comedies hold that the past films don’t? 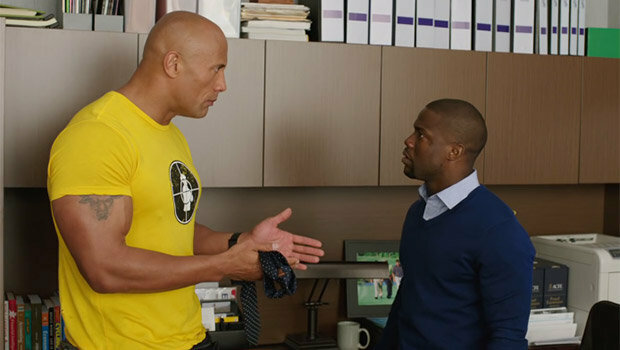 When relating this to ‘Central Intelligence‘, it seems like the filmmakers thought it would be a lot of fun to put these two personalities together and basically let them riff off each other for a couple of hours. Throw in a some guns and a half baked plot about world security and terror, along with a message about being bullied, and you have yourself ‘Central Intelligence‘. This film doesn’t really pay attention to much with the actual plot at hand here, but more or less has Hart and ‘The Rock‘ running around in comical scenes with some action to move the so-called story along. I know that doesn’t sound great, but the chemistry and comedy between these two is quite funny and charming all at the same time. It’s this only aspect that makes the film watchable and thoroughly enjoyable. You’ve seen better action scenes before in other films and you’ve laughed harder elsewhere too, but when these two actors come together, they make for a hilarious duo. I wouldn’t be surprised if there is a sequel to this at some point. The film starts out back in the mid-90s where Calvin Joyner (Hart) and Bob Stone (The Rock) are in high school. Calvin is the star of the school and is involved in everything from sports to theatre and is most likely to succeed. Bob Stone is a fat kid with braces who loves John Hughes and sings in the public high school shower. After a major embarrassing incident in the middle of the whole school, Bob is truly defeated and Calvin is the only one who helps. Cut to present day where Calvin is unhappy with his mediocre accounting job and Bob Stone is now ‘The Rock‘. Sooner than later, bad guys and even the CIA are gunning for Bob Stone and Calvin now, and you never know if Bob Stone is an enemy of the state or the good guy, but none of this really matters here, as an excellent field of cameos pop up and the jokes between The Rock and Hart are almost endless, with the exception of when Calvin is trying to decide if his old friend is trustworthy. 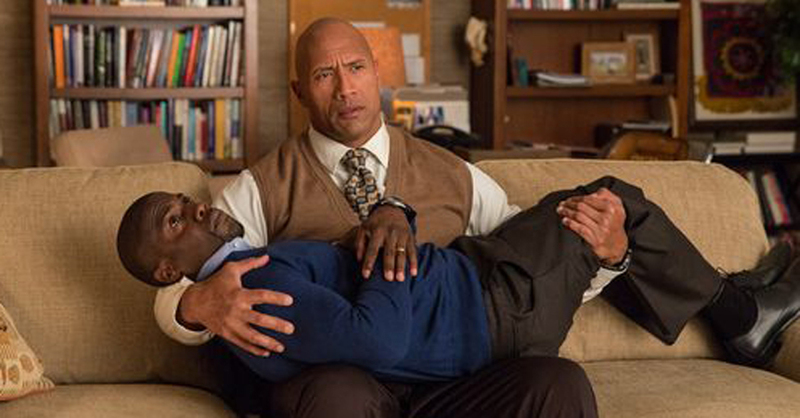 Again, ‘Central Intelligence‘ isn’t the ultimate buddy-cop action comedy, but it certainly has its moments. There are a ton of movie references, some solid comedy, and ‘The Rock‘ wearing a unicorn T-Shirt. You just can’t get enough of that silly fun. Stay tuned during the credits for outtakes. This entry was posted on Wednesday, June 15th, 2016 at 11:54 am	and is filed under Film, News. You can follow any responses to this entry through the RSS 2.0 feed. You can skip to the end and leave a response. Pinging is currently not allowed. « Is Steven Spielberg Heading To The Jungles of Vietnam?!? !